Too many meetings are held just for the sake of having a meeting. Often, the meeting purpose no longer exists, but the meeting continues. Some will say, “We’ve always had the meeting so we should always have it!” These meetings are most likely a waste of time because they are not effective. When you organize people into a meeting, make sure you are holding an effective meeting. If you plan your meetings using the eight points outlined below, your meetings are much more likely to be successful. Effective meeting have a purpose. Meetings should be used to make decisions or convey information that can only be done in a meeting setting. Oftentimes people hold meetings to convey information that could easily be sent in an email. Having a meeting to convey that kind of information is not a good purpose for having a meeting. If you can send an email, just send the email so people can use their time more effectively. This is especially important when people have to travel long distances to attend the meeting. When determining whether to have a meeting, consider these tips about effective communication. There are, however, many good reasons for having meetings. The list below contains several reasons to have a meeting. It is not an all-inclusive list, but it helps identify types of scenarios that would require a meeting. Kick-off meeting – This is useful on large complex projects that involve multiple parties. Coordination meeting – Everyone needs to be on the same page before moving forward on work. Decision meeting – Come to a consensus on important decisions quickly. These meetings are used to eliminate lengthy back and forth email strings, multiple phone calls, etc. Brainstorming session – Often people can feed off each other to come up with a creative solution when they are brainstorming together. Training – One person can teach many people something new in a teacher-student setting. The students can also teach each other the information they learn to cement the information in their minds. Safety meetings – Safety meetings heighten people’s awareness to safety and the potential hazards that exist. There are many other valid reasons for having effective meetings. Be sure to only call meetings, however, when there’s a valid purpose so people’s time is not wasted. Having the right people in the meeting is just as important as having a purpose for your meeting. When you call a meeting, you should have the right people in the room so you can reach solutions. If you will be making important decisions, be sure to have the decision makers in the meeting. When implementing a new procedure, have those in charge of implementing it in the meeting. When brainstorming, have the people that currently DO the work in the room. Encourage effective communication so each person provide feedback and gives their buy-in on the decisions. Effective communication in the meeting will determine the success of the meeting. You won’t be able to have effective meetings if you don’t have the right people in the room. You may create great solutions, but lack the proper buy-in or decision making powers you need to move forward. The most ineffective meetings I have ever attended have been the ones where there was no agenda from the start. Everyone showed up to the meetings with different expectations which led to confusion, frustration, and ineffective meetings. There is no substitute for adequate preparation. Effective meeting preparation enables everyone to show up to the meeting prepared for discussion on the identified topics. The following four steps will help everyone be more prepared for your meetings. First, send the agenda to the meeting participants prior to the meeting. This allows everyone to review the discussion topics and prepare for the meeting. Additionally, if people are unfamiliar with some topics, they can research and prepare for the discussion topics. Second, give people pre-meeting assignments. When you give pre-meeting assignments, people are much more likely to show up prepared for the discussion topics. Assign people to read materials, take tests, obtain information, or do other actions specific to the meeting. For example, I attended a training class where the instructor gave pre-meeting assignments. About a month before the class, he emailed attendees requesting they read some articles and take tests for the meeting. Since everyone received the same email, everyone had the material and was prepared. As another example, I was the co-chair on a procedure change team for several very specific procedures. Prior to each team meeting, I sent an agenda and gave specific assignments so everyone would arrive prepared. As hoped, people arrived much more prepared to discuss the topics. We didn’t spend important time laying the foundation, but were able to jump right into discussion. Third, assign specific meeting topics to different people. When you assign people to talk on specific topics, it gets them more involved in the meeting and discussion topics. They often prepare more for the meeting and gain experience helping keep everyone focused and on topic. It also helps people learn the topics more thoroughly so they become an expert on whatever they talk about. Fourth, create meeting rules for effective meetings. The meeting will start and end on time. Each person is expected to come prepared for the discussion. Discussion topics outside the scope of the meeting will be tabled for future discussions. Each person will have equal opportunity to speak and have their points heard. Titles don’t exist in the meeting; everyone is a meeting participant. No one is exempt from following the rules. The rules for effective meetings help everyone know expectations so they act accordingly. They also provide a framework for the meeting by setting standards. Once the meeting has started, stay focused on the predetermined agenda topics. The first four keys are meaningless if you don’t stay focused once you are in the meeting. Also, before the meeting prepare mentally so you can manage the meeting when everyone is together. If you know beforehand that it’s difficult for specific people to stay focused, ask for their help in staying focused. If they agree to help, give them responsibility over specific tasks to keep others on topic as well. For example, ask them to guide certain discussions or monitor and take action to minimize distractions. Giving them responsibility gives them part-ownership over the meeting outcome. It will likely help them and everyone else stay on task. As a result, you will have a much more focused meeting. When the meeting focus is lost, the pre-meeting preparation work becomes wasted or untimely effort. Additionally, since the meeting was important enough to schedule, it must be reschedule for another time. Therefore, do all you can to stay on topic to accomplish your goals and meeting purpose. In short, to maintain effective meetings, stay focused. I’ve attended many meetings where there was extensive discussion, but no one took notes or minutes. After the meeting ended and a few days had passed, everyone had completely forgotten their action items from the meeting. Why? Because no one took meeting minutes or sent them to everyone in attendance. Tracking the information outlined above creates a record of the meeting that can be referred back to in the future. That record will be very useful. Tracking the assignments/action items is one of the most important parts of following through on effective meetings. Track each assigned action item and important details resulting from the meeting. Be sure that the action items are clear and that they follow the same criteria as SMART goals. The action items should be specific, measurable, achievable, realistic, and timely. If the action items are outside that criteria, they will likely be unsuccessful. At the end of effective meetings, review the action items with each person in attendance. Make sure the action items are clear. And most importantly, request that each person records their action items so they complete them. Additionally, when distributing meeting minutes, lay out the expectations in a clear and concise way. This helps confirm the action items discussed in the meeting. By tracking the action items, you hold people accountable. When people know you are tracking action items, they’re often more attentive and actively participate in the meeting discussion. You cannot have effective meetings without follow-up. Follow-up is essential. Some people complete their action items with little to no follow up. Others, however, won’t do their action items unless they are constantly reminded. Those people often forget or put the action item to the side. At the end of each meeting, give each person a specific follow-up timeline and then follow through. By following through, you demonstrate that accountability is important and others should do what they say they will do. Don’t be discouraged if they have not completed their action items. Instead, realize that people have other responsibilities and they probably didn’t realize the importance of the action item time frame. Reiterate the importance of completing the action item and give them a new completion date. Another technique, is to follow-up a day or two before the action item deadline to observe progress. Let them know that you are there to help and the completion of the action item is important to you. Ask them if they are having any problems or trouble completing the action item. If they are, be willing to help identify alternative methods to complete the action items. The goal is to provide support without micromanaging or doing the task for them. When people feel that you support them on their action item, they are more likely to complete them. This is especially the case if they know you will follow up with them afterwards. Following these steps will help you run effective meetings to be more productive and use your time effectively. To aid you in following the 8 Keys to Run Effective Meetings, I created two quick reference business cards. Follow the two links below and print them out for your use. Now that you know the 8 Keys to Run Effective Meetings, it is important to begin using and following them. Write out the steps and determine how they are applicable to you and the meetings you hold. If you are anything like me, you hold your own meetings, and attend meetings held by others. When you attend meetings held by others, share this information and encourage others to follow it. That will help them hold more effective meetings also. 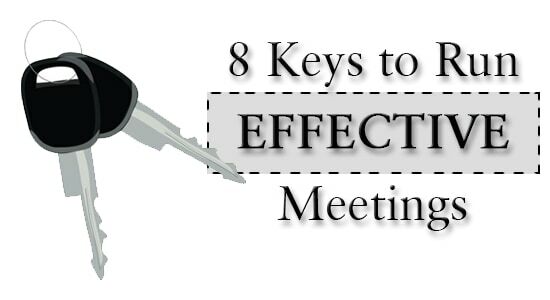 As you help others follow the 8 Keys to Fun Effective Meetings, your meetings will be much more successful. Have you used any of the 8 Keys to Run Effective Meetings before? If so, how did it help you create effective meetings? Is there a key that stood out more to you than the rest? If so, why? Please share your thoughts in the comments section below!